Research update with Dr. Graham Pearson, University of Alberta, Post Doctoral Fellows Janina Czas and Adrien Vezinet. Mantle Group Project leads: Dr. Graham Pearson, University of Alberta; Dr. Steven B. Shirey, Carnegie Institution for Science; Dr. Richard Carlson, Carnegie Institution for Science; and Dr. Richard J. Walker, University of Maryland. Minerals in economic concentrations are found in earths crust. Ultimately, the source of all these minerals that end up in the crust, came from the mantle. Surprisingly, even though the mantle is that main source, there is very little that is known about the distribution of key metals. In particular, the location, spatial distribution and mechanism of transfer of gold from the mantle into the earths crust. The Mantle Group investigates the relationships between the earths crust and the mantle to contribute to project Metal Earth’s efforts. They are focused around mapping and characterizing the shallowest portion of earths crust to try and establish the link between all that data and the underlining deep seeded processes that took place to facilitate the mineralization process. 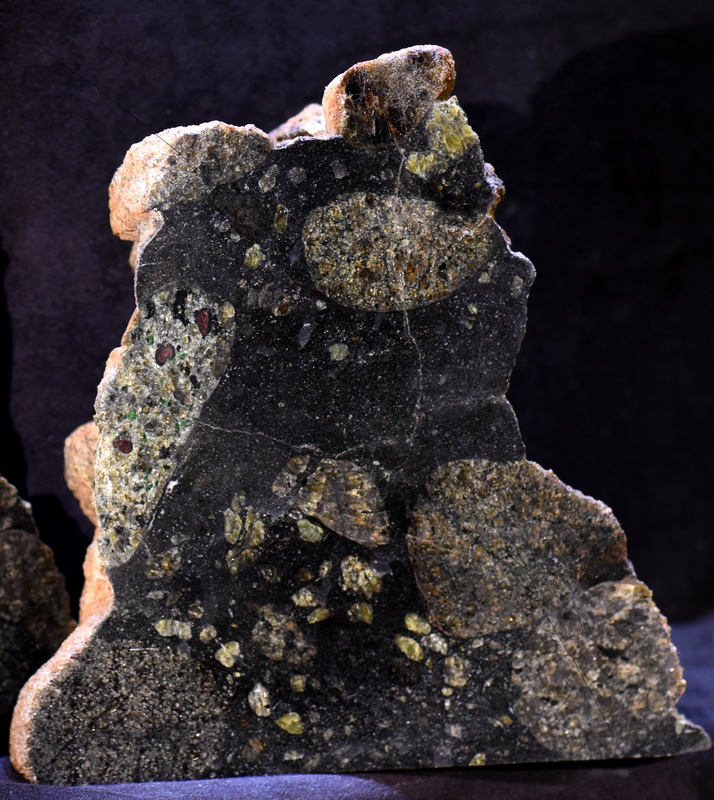 Image Above: Peridotite xenoliths – rounded fragments of green rock - from the lithospheric mantle within a fine grained matrix of volcanic rock (dark grey). Questions driving the research team. Ultimately, all metal enrichment in Earth’s crust derives directly, or indirectly, from the mantle. Given this, it is surprising that there is very little information on how, and on what timescale, the lithospheric mantle underpinning continents stores metals for later enrichment in the crust, or whether it merely acts as a pathway for metal transfer straight from the convecting part of the mantle. Considering all the work that has been performed historically on understanding gold mineralization, the study of where gold sits in Earth’s mantle and how it gets into the crust in economically viable proportions is still in its infancy. The second driver for the mantle group is examining the mechanisms of crust extraction from the mantle through time and how that has affected metal endowment and localization in cratons – specifically the Superior craton. Curiously, metal endowment is almost totally absent in Earth’s oldest crust – formed in the Hadean and Eoarchean (4.55 to 3.6 Ga). In contrast the majority of Earth’s gold is extracted from rocks of Paleo to Neoarchean age (3.6 to 2.5 Ga). A key question is: What drove this transition? Was it related to the mechanism of crust formation or the protection of the crust by continental mantle roots? 1) To evaluate the role of the lithospheric mantle in controlling metal endowment in cratons, with a view to using this information to find new mineral deposits. 2) To examine how the changing mechanisms of crust formation can be used to predict metal endowment in cratons. What are some examples of changing mechanisms? These two objectives should illustrate the importance of crust-mantle interaction in creating world class mineral deposits. “Everybody that is interested in exploration, anywhere on earth, will benefit from new information that is generated by this project. Whether or not you’re a small junior company doing grassroots exploration or a major multi national company looking for tier 1 world class deposits, the information is relevant across the board to all types of mineral deposits." From a fundamental science perspective, the formation of Earth’s earliest continents is one of the most important enduring problems in all of Earth Science. Our results are already helping to better understand crust formation and hydrosphere – crust interaction in the earliest parts of Earth history. In addition, the geochemical results will provide fundamental understanding of how the mantle roots that underpin these continents formed and what their role was in preserving mineral deposits. 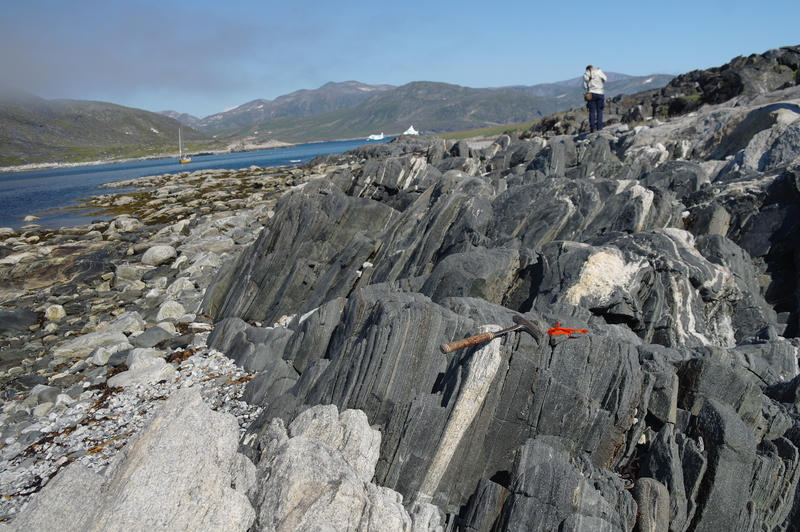 Image right: This outcrop is located on the Nulliak Island (Saglek Block) and consists in Eoarchean (> 3.6 Ga) amphibolite which underwent partial melting event. The rock investigated by Vezinet et al., 2018 (EPLS) has been sampled from the outcrop exposed on the far shore of this picture. From the economic perspective, we are providing fundamental information on the role of the lithospheric mantle in creating and preserving mineral deposits. This information can be fed directly back into exploration models for new deposits. In addition, understanding the control of crust formation mechanisms on metal endowment may provide an over-arching model of how to target crustal rocks of specific composition for metal exploration. From a non-metal perspective an additional benefit of the project is that it is also providing useful information about the reasons that only very specific areas of the Superior craton have been mineralized for diamonds. As the Superior craton is the world’s largest extant craton its weak diamond yield is very surprising. 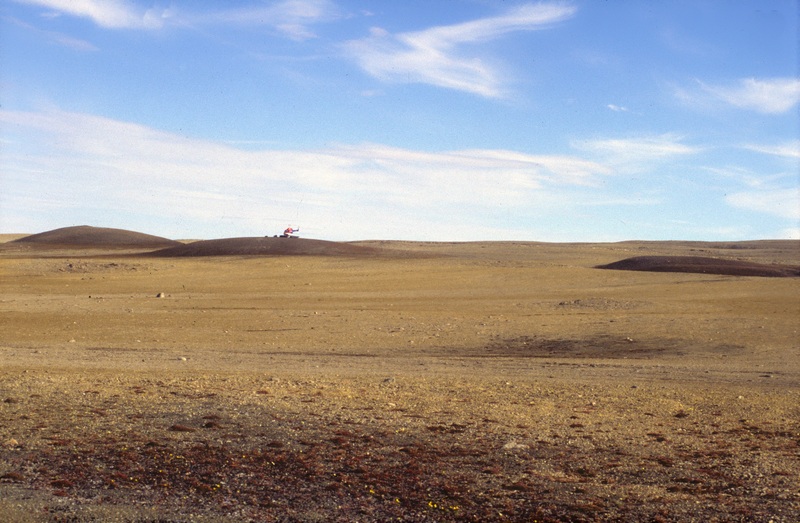 Image Left: Example of kimberlite in the field, pictured here are three kimberlite outcrops (dark brown hills) Northern Canada; helicopter for scale. 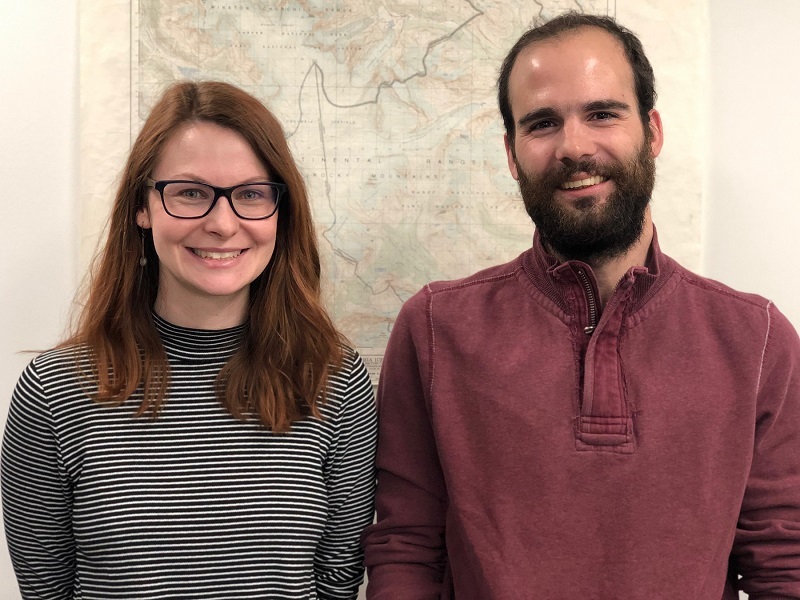 One major output so far is that post-doc Adrien Vezinet has produced the first detailed tracer isotopic and geochronological study of the Eoarchean Saglek block in Labrador, which will be used as a benchmark to compare how the oldest parts of the Superior craton crust formed. This was published in the high impact factor journal Earth & Planetary Science Letters. This study also found the earliest evidence for the interaction of the hydrosphere with the Earth’s crust in a solid rock. The importance of this is that fluid-rock interaction is perhaps the key process in driving metal enrichment. Our studies of the Kirkland Lake mantle xenolith suite have revealed that the mantle lithosphere root beneath this part of the Superior craton formed in the Neoarchean, possibly after the formation of the greenstone belts. We are looking at how the complex precious metal characteristics of these rocks tell us about how gold and other metals might have been transferred from mantle to crust at this time. “Being involved in the metal earth project offers the opportunity to be involved in one of the largest geological research projects ever. We have the opportunity to transform our understanding of the formation of metal deposits, both in the Archean and in the present day." "Having the latitude in our group to explore some of the more fundamental questions about what the mechanisms are of metal transport in the context of a much larger project where other people are getting complementary data is a rare opportunity." Image Above: Metal Earth Postdocs in the Mantle Group at the University of Alberta: Drs. Adrien Vezinet and Janina Czas.